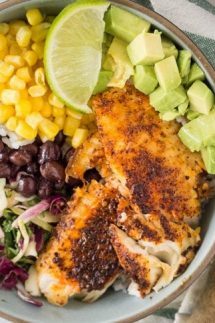 Fish Taco Bowl – this is a family favorite, especially during spring break when we visit the beaches on the Alabama and Florida Gulf Coast! There’s no shortage of fish restaurants in the area and Blackened Fish Taco Bowls are one of my favorite things to eat when we’re there. What does it mean to Blacken Fish? Blackening fish is a cooking technique that originated with Chef Paul Prudhomme from Louisiana. It involves dredging the food such as chicken or fish in a mixture of herbs and spices and then cooking it in butter, usually in a hot cast iron skillet. I used olive oil in a skillet, or you can bake it in the oven or cook it on a grill to get the same effect. It produces a lovely seared effect on the surface of the food that’s not burnt although it may look like that. pick a firm fleshed white fish, tilapia is always available and cod or haddock work well too. Keep your skillet on a medium heat for cooking the fish, if your skillet is too hot you run the risk of burning it. Cook your rice ahead of time so you’re ready to plate up your fish taco bowls! 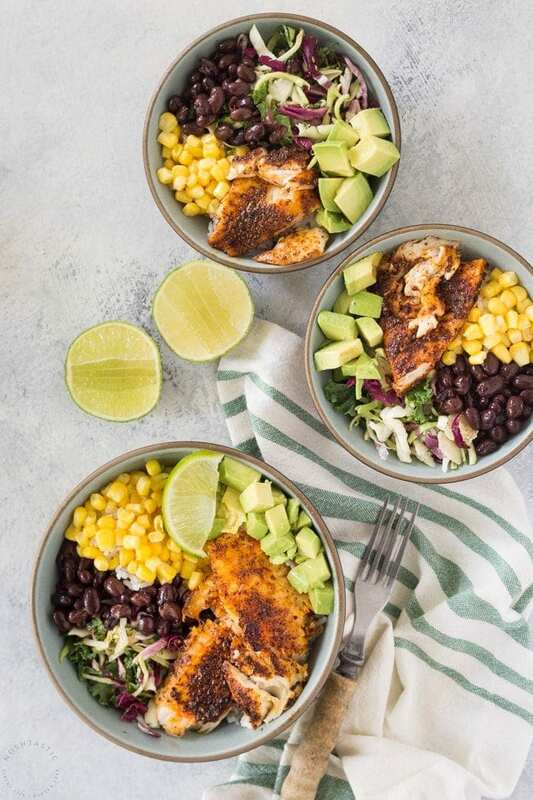 And if you’re looking for an alternative Fish Taco Bowl recipe with different flavors, you’ll love my friend Natalie recipe for Chili Lime Fish Taco Bowls, the crema looks fantastic! 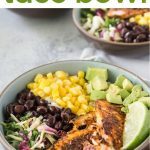 Made from scratch Fish Taco Bowls recipe, cooks really quickly and makes for a healthy easy meal in minutes. In a small bowl mix together all the fish taco spices and seasonings listed above. Rub the spice mix over both sides of the fish fillets. Heat acast iron skillet on high heat until hot and add the oil, give it a minute to heat the oil. Add the fish to the skillet and cook for 3-4 mins per side on a medium heat until it's cooked through, it will be blackened on the outside, but not burnt. To bake fish in the oven, add the spice rubbed fish to a sheet pan and bake in a hot oven at 375F for 10-20 minutes or until the fish is cooked through. Add cooked rice to bowls and serve with the fish and vegetables and beans on top, if you like you can add sour cream and cheese too. 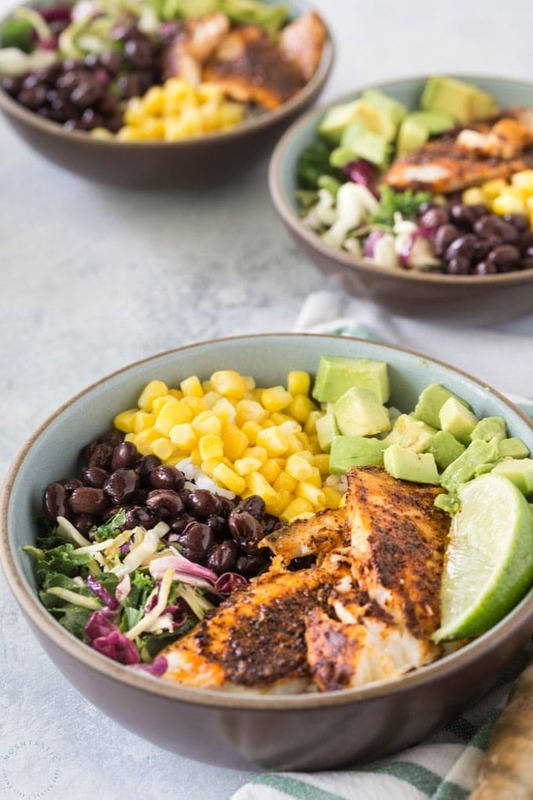 Assemble your fish taco bowl with cooked rice, black beans, corn, shredded cabbage, green onions, chopped avocado, slice of lime, and top with sour cream if desired. Thank you Tricia, I’ve been ‘blackening’ all sorts of things since I made the taco bowls, it’s a great way to cook meat. What part goes into the rub for the fish? The ingredients are all put together. Hi Kathie, I’m sorry for the confusion, I’ve updated it to make it clearer. The rub includes all the spices and seasonings listed in the first part of the recipe. Thank you so much! I’m making it this week! Do you know the macro breakdown on this?? do you mean the nutritional details and calorie count? I don’t have an easy way to provide that accurately for my blog but I think if you go to caloriecount.com and paste in the ingredients it will give you what you need, I hope that helps. Hi Sara, I’m sorry for the confusion, I get my British and American onion names mixed up! They’re green onions.